One of the many things I’d planned to do on the blog this summer was to write several book reviews and host a book giveaway. I know that the summer is not over, but it’s rapidly passing. I cannot believe that June has almost bid adieu. I have several tasks beckoning me to come hither and brand new books calling me to sit with them, but I have set aside everything in order to get back on track with my blogging. That’s not a sacrifice, because if I could, I would write all. day. long. Today I wanted to share some books that have delighted me this summer. I try to stay ahead of my children’s reading, but that hasn’t gone too well. I hate to read science fiction or fantasy, which my older ones love. Terry and I have set some guidelines for their reading, and so far, they have kept them. I know this because they’ve turned in books to me, unfinished, because they have fallen short of those guidelines. While I don’t read sci-fi or fantasy, I am always seeking out books for them that I’ve heard are good, or that I’ve enjoyed myself. I offer a few of these to you today. These are sure to put a smile on your face. Yes, they are children’s books, but with books, the saying “Age doesn’t matter.” is actually true. I had seen this title several times on book lists and library shelves, but assumed it was a tale of adventure at sea- which is not my thing. How wrong was I! It does have its share of seafaring adventure, but it also has much more! It’s a biography of the young man who wrote what is commonly known as “The Navigator’s Bible”. 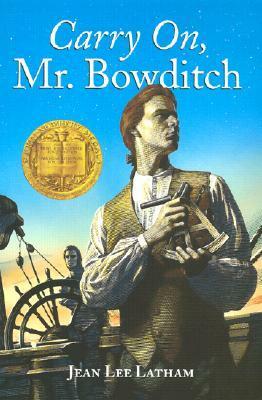 The American Practical Navigator, by Nathaniel Bowditch, has saved countless lives due to the accurate calculations which he painstakingly worked. He had a very difficult childhood, but rose above it all to become a pioneer on the high seas. This book will encourage your child to work hard and overcome obstacles and to always hope for the best. Would you like to have clam chowder for lunch? If so, I have the book for you! 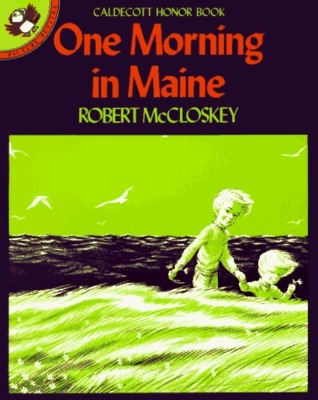 I have read several books by Robert McCloskey, but this one was new to me. I have always been fascinated with New England, so I picked it up to read to my younger ones. It’s a delightful little story, but Mr. McCloskey’s signature drawings set it apart. They make you feel as though you’re actually visiting the sea shore, the wooded hills and eating clam chowder for lunch. This book had us laughing on page one! It’s a crazy story with no basis in reality, but it’s a hoot. I read this book aloud to the children and was bit surprised that there were a few curse words and several crude words, which I skipped or changed as I went along. The main character, Annabel, is a rather rebellious young girl who dislikes herself, her brother and disrespects her mother. Through this one “freaky Friday”, she comes to appreciate her mother and her younger brother for the first time. She also comes to see she a bit of her own value, too. Just be prepared to alter the language or warn your young readers about it ahead of time. Nine year old Marly needs a miracle. Her father has come home from the war (WWII) after being imprisoned and assumed dead. It’s not the happy homecoming that Marly thought it would be, though. The war has changed her father. When her family gets the opportunity to move to Maple Hill – a house owned by Marly’s deceased grandmother – Marly is given hope. 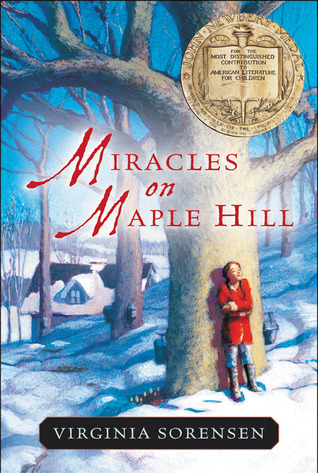 It is there that she and her brother, Joe, get to meet Mr. Chris, Harry the Hermit and see the miracles that occur on Maple Hill every day. But will she get the miracle she needs most of all, a healthy daddy? Read and find out! There’s something fishy going on at Sugar Hill Hall. Emily Luccock is supposed to move in with her Aunt and Uncle Twice after her parents’ death, but she is shocked to learn that it’s been taken over by the evil Mrs. Meeching. 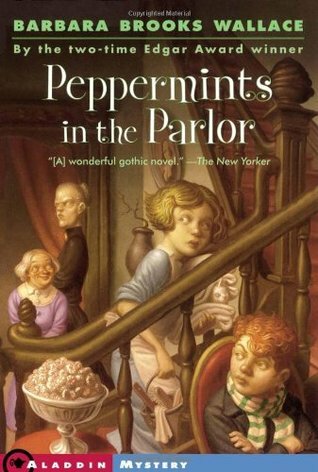 Why is the house full of old people staring at a bowl of delicious peppermints, but are never allowed to taste any? And what happened to Uncle Twice? One mystery seems to lead to another, but Emily is determined to get answers, no matter the cost! Join her for the adventure and have some laughs along the way. Barbara Brooks Wallace has written several books of this type, but I have only read this one. We plan to read more of her books in the future. 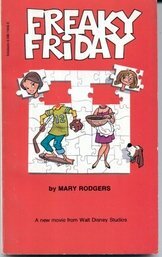 I remember reading Freaky Friday as a kid, and Miracles on Maple Hill as an adult, but I haven’t read the others. I love reading good books! One day, I want to read all of the Caldecott and Newberry books just to say I have. I like your Goodreads widget in your sidebar. I’ll have to start typing up reviews in Goodreads and put the widget in my blog. Like you, names and details escape my memory all too quickly. Usually, I’m left with a general impression of “This is a great book!” or “We laughed at this one!” or, sadly, “Boring!” I also can remember a scene or two or an event in the book. I guess I suffer from Information Overload! By the way, Mrs. Mike is a great book! It’s very sad in one part, though (the part that I remember when thinking of the book.). Thanks for this list! They look great. I had never thought Carry on Mr. Bowditch looked very interesting but I think we will give it a try.